The Recreation Activity Center, or RAC, is a state of the art recreation center and the center of campus life for many Georgia Southern students. Originally opened in 1998 with 80,000 square feet, the facility was expanded in 2006 to its present size of 215,000 square feet. There are over 10 grass soccer pitches with lights for evening games and activities. Each day the RAC welcomes over 5,500 visitors! The home of Georgia Southern Soccer is one of the top pitches in the Southeast. It features a main stand with seating for 1000 fans as well as grassy areas for fans to bring lawn chairs to watch the match. Air conditioned locker rooms are located behind the main stands. The stadium's press box features internet connections for media and a filming deck for the coaching staffs. A project to install a MUSCO lighting system was completed during the 2012 soccer season and allowed the team's to play their first night games at Eagle Field that season. This is also the home facility of the Tormenta FC of the USL and PDL. 2000 Northeast 10 Conference Coach of the Year. 2000 NEISL College Coach of the Year. 1999 Eastern Massachusetts High School College Coach of the Year. 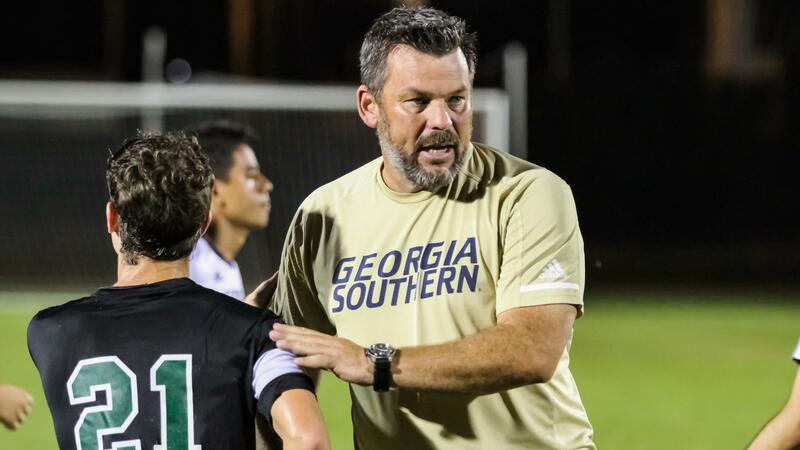 John Murphy recently completed his third season as the head men's soccer coach at Georgia Southern University. Murphy became the program’s seventh head coach when Director of Athletics Tom Kleinlein made the announcement on July 26, 2016. In 2018, The Eagles started seven freshmen regularly throughout the season and advanced to the Sun Belt Championship game for the first time since 2014. The program earned #74 in the final RPI ranking, the highest in program history. The average RPI of teams defeating Georgia Southern in 2018 was an astounding #52. Additionally, the strength of schedule was rated #42 out of 206 Division I Men’s soccer programs. Senior Javier Carbonell was named Sun Belt Player of the Year, Offensive Player of the Year and was the fifth leading scorer in the Nation. Sophomore Aldair Cortes lead the Sun Belt with assists, while Junior Gonzalo Talvera and freshman Sam Mayer earned all-conference honors. In 2017, Georgia Southern finished with a 9-8-1 overall record, the first winning record for the Eagles since 2006. The program also earned United Soccer Coaches (formerly NSCAA) Southeast Region rankings for the first time since 2008, finishing the year ranked No. 10 in the region. Among the individual awards earned by Eagle players were two major Sun Belt honors - midfielder Javier Carbonell was named the Sun Belt Newcomer of the Year, while Aldair Cortes was named the Freshman of the Year. Both players earned All-Conference honors, along with second-team honorees Blake Wilson and Emil Laursen. Laursen was later named a first-team CoSIDA Academic All-American, the first time that a Georgia Southern men's soccer player has earned first-team Academic All-America honors. A 20-year coaching veteran, Murphy has 10 years of coaching experience in the professional ranks - including having coached in over 300 professional matches - and has served as an assistant coach at Boston College, Clemson and Brown. He was also a head coach at Anderson University (S.C.) (2012-13), Livingston Football Club (FC) (2009), Assumption College (1998-2000) and Massasoit Community College (1994), his alma mater. He was twice named the National Soccer Coaches Association of America (NSCAA) New England Coach of the Year in 1994 and again in 2000 and was the 2016 Sun Belt Conference Coach of the Year. Murphy has guided his teams to 10 conference titles and has developed three players to Freshman of the Year honors and one Defender of the Year. His Massasoit team earned the 1994 National Junior College Athletic Association (NJCAA) National Academic Male Team award for highest GPA and Assumption College won the 2000 Eastern College Athletic Conference (ECAC) Division II championship. Murphy also helped guide the 2014 and 2015 BC Eagles to the NSCAA College Team Academic award for Division I teams with a 3.0 or better GPA. In 2009, he became the first American citizen to work in British professional soccer as a coach when he was hired by Livingston FC of the Scottish First Division. During that time, he worked with current standout players Leigh Griffiths (Celtic), Andy Halliday (Rangers) and Murray Davidson (St. Johnstone). In his first season in Statesboro, the Eagles went 8-8-3 overall and 3-1-1 in Sun Belt Conference play, claiming a share of the regular-season league title with newcomer Coastal Carolina and earning a bye into the semifinal round of the Sun Belt Championship. The regular-season title is the first conference title for Georgia Southern in men’s soccer. The Eagles also ended the year 4-1-1 at home and 4-7-2 on the road. The Eagles’ 3-1-1 (.700) conference record was the best since the 2006 season when Georgia Southern went 4-1-2 (.714) in SoCon play. The 4-1-1 (.750) home mark was the best record in Statesboro for the men’s team since the 1997 season. That year, the Eagles went 6-1 at home. During the season, the Eagles competed well against some of the best competition in the southeast. Georgia Southern defeated both Mercer and rival Georgia State on the road and were victorious over four teams that were ranked in the top-10 of the National Soccer Coaches of America Association (NSCAA) Southeast Region Poll. The victories included: 2-1 on the road over Stetson (7th at the time) on Sept. 2, 2-0 at home over North Florida (5th) on Sept. 24, 3-1 on the road at Georgia State (9th) on Oct. 8 and 2-1 at home against Hartwick (5th) on Oct. 22. The Eagles also took South Carolina to overtime, earned a 0-0, double-overtime draw at Coastal Carolina and took Clemson and Duke down to the wire in close, one-goal decisions. Murphy picked up his first win at the helm of the program on Aug. 26 as Georgia Southern easily defeated Houston Baptist 4-1 on the road. His first home win came against North Florida. Following the year, Murphy and four Eagle players were recognized by the conference office for their efforts during the season. Murphy was named the Sun Belt Coach of the Year while sophomore defender Emil Laursen earned Defensive Player of the Year honors to go along with Sun Belt Championship All-Tournament plaudits. Laursen and junior forward Blake Wilson were both named to the All-Sun Belt Conference First Team while junior Nick Wells and freshman Sander Wang earned second-team honors. Additionally, Laursen and Adam Abdellaoui were named to the College Sports Information Directors of America (CoSIDA) Academic All-District 4 First Team for their work in the classroom. During the year, Laursen, Wilson and freshman Justin Little picked up weekly awards from the league office. Laursen was a two-time Defensive Student-Athlete of the Week, Wilson was named Offensive Student-Athlete of the Week twice and Little picked up the first honors of the year with Defensive Student-Athlete of the Week honors in the first week of the season. Prior to the season, junior midfielder Thor Sveinbjornsson was named a Preseason All-Sun Belt selection. Prior to arriving in Statesboro, Murphy served as the associate head coach and recruiting coordinator at Boston College where he was a member of New England Soccer Hall of Fame head coach Ed Kelly’s staff for two years. As Boston College’s recruiting coordinator, Murphy oversaw a 12-player recruiting class that was rated in the College Soccer News 2015 Top 50 Recruiting Classes and an additional 12-player recruiting class for 2016. The 2015 squad had one of the best turnarounds in NCAA Division I with an 11-8-3 record, and advanced to the NCAA Tournament Elite Eight while beating Vermont, the University of South Florida and Georgetown along the way. For his efforts, Muprhy was named as one of the top Division I assistant coaches in 2015 by College Soccer News. Additionally, Murphy was the lead radio analyst for the New England Revolution matches on 98.5 the Sports Hub. His work in the community included leading the NEFC U-18 Boys to the NPL National Championship game this past July in Denver, Colorado. Before joining the Boston College staff, Murphy spent two seasons at as the head coach of the Anderson Trojans (S.C.) where he compiled a record of 18-17-7, including a +6 improvement in win total from his first season to his second. He led the Trojans to the South Atlantic Conference (SAC) tournament title in his first season (2012) and they qualified for the NCAA Tournament in his second season (2013) following a return trip to the SAC Tournament Finals. Anderson was ranked as high as No. 19 in the NSCAA national poll in 2013. Before leading Anderson, Murphy was an assistant coach and the recruiting coordinator for two years at Clemson. His two recruiting classes for the Tigers both ranked in the top 20 in the nation according to College Soccer News. Those classes eventually helped Clemson to the 2014 ACC Tournament Title and the 2015 College Cup Final appearance. Murphy has also spent nine seasons on the Major League Soccer sidelines. He served as an assistant coach for the New England Revolution (2000-03) and the Columbus Crew SC (2004) before serving as an assistant coach and director of player development for the Colorado Rapids (2005-08). While with the Rapids, he also served as the head coach for the reserve team and guided them to the Reserve League championship in 2007 with an undefeated 7-0-1 record. The core of that team went on to win the MLS Cup in 2010. Columbus won its first Eastern Conference regular-season title and the 2004 MLS Supporters’ Shield in Murphy’s one year as an assistant and New England was a finalist in the 2001 US Open Cup and the 2002 MLS Cup while he was on the staff. Murphy’s eye for talent in the college drafts assisted each club in their acquisitions of players such as Clint Dempsey, Taylor Twellman and Shalrie Joseph (New England) as well as Bouna Coundoul, Jacob Peterson and Nick Labrocca (Colorado). In both New England and Colorado, Murphy was also charged with establishing and growing two separate youth academies, overseeing philosophy, curriculum development and programming. His ability to identify and develop talent at every level he has worked is further highlighted by the number of former players drafted in Major League soccer since his return to the college game in 2010. Amadu Dia (Sporting Kansas City) Phanuel Kavita (Real Salt Lake), Andrew Tarbell (San Jose Earthquakes) Manolo Sanchez (New York Red Bulls), Zeiko Lewis (New York Red Bulls), and Alex Kapp (Atlanta United) all have taken the next step after spending time with Coach Murphy during this period. Murphy’s first Division I coaching experience came at Brown University where he was current Clemson head coach Mike Noonan’s assistant from 1995-98. During his three seasons at Brown, Murphy helped guide the Bears to three NCAA tournament appearances and Ivy League Conference Titles in 1995 and 1997. The Bears were ranked as high as third during the 1995 campaign, the program’s highest national ranking. Murphy got his coaching start at his alma mater, Massasoit Community College, where he led the Warriors to an 18-4-2 record in 1994. That season, Murphy and the Warriors claimed the Colonial States Conference title, were crowned the NJCAA New England Champions and were the NJCAA national semi-finalists, scoring 122 goals along the way. That mark was a national junior college record at the time. Murphy has authored two books on soccer and published an instructional DVD set through Championship Productions. As an NSCAA National Staff Coach, Murphy is well known nation-wide as an educator and advocate for the game. He holds the UEFA Pro Badge from the Scottish Football Association, a U.S. Soccer “A” License and a NSCAA Advanced National Diploma. He was the first foreign-born coach to earn an English Football Association “A” Goalkeeper Coaching License in 2003. A native of Quincy, Massachusetts, Murphy earned an associate’s degree from Massasoit Community College, a bachelor’s degree from Bridgewater State and a degree in applied management from the University of Warwick in conjunction with the League Managers Association of England. He played in goal at Massasoit in 1985-86 and was a member of the undefeated 1986 NJCAA national championship team. Murphy was enshrined in the Massasoit Community College Hall of Fame in 2010 as a member of that 1986 team. John and his wife, Erin, have three sons, Shay (13), Eamon (10) and Declan (7) and they live in Brooklet.